Can you give me a price in Indian currency for Brother DCP135C colour ink cartridges? Sorry, we only deliver within the UK so the price of our Brother DCP-135C ink cartridges is only available in GBP. How do I check the ink levels on my Brother DCP-135C? Trying to estimate the cost of a document using various colours of text and small clip art pictures dotted here and there on most pages. Using a Brother DCP 135 and your premium brand ink is it really approximately just 0.5 pence per page as indicated on your site? This seems very little but great if it's about right, or am I not understanding something somewhere? Thanks for your time, Bill. The price per page is calculated using the page yield of each cartridge. The black cartridge is expected to do about 500 pages at a 5% coverage on an A4 page and each of the colour cartridges should achieve about 400 pages based on the same coverage of 5%, which is about 4 - 5 lines of text on each page. Therefore, with the total page yield for all four cartridges and the current price of the pack this works out at approximately 0.5p per page. However, this does depend on the coverage of ink on each page. Is there a DCP 135e printer? The closest to this I see is the DCP 135? Unfortunately, I don't believe there is a DCP 135e. This model is not listed on Brother's UK website and we had not heard of this printer prior to your enquiry. We do list the DCP 135C as shown here. Please ensure that your printer was purchased in the UK and you're ordering for the correct make and model of printer. Your Brother DCP 135C printer can be relied on to do the job. The print quality and speed are reliable. The printer is great, but the price of replacement cartridges has probably got you down. By now, you have tried every discount retailer in town for naught: they sell everything at a discount except replacement cartridges for your Brother DCP 135C printer. If you are anxious that you'll never find a reasonable price on Brother DCP 135C ink cartridges, you can take it easy. All you have to do is purchase your Brother DCP 135C cartridges from Cartridge Save and save a bundle! Looking For Cheap Ink for the Brother DCP 135C? Does ordering from an online discounter worry you? Do you think that you will save money by sacrificing service? Not at Cartridge Save. We deliver your cartridges to you at no charge. That's right, your cartridge will be delivered to you at NO CHARGE. Not only that, but if you are less than satisfied for any reason, you will get a full refund if you return your Brother DCP135C cartridge. That's how confident we are that you will be pleased with the quality of our cartridges! The Brother DCP135C multifunction printer features a USB memory drive, a flatbed scanner, and a copier, which are built around a colour inkjet printer. The Brother DCP135C claims fast print speeds because of a powerful engine. Users appreciate its low initial cost, but the actual performance of the DCP-135C inkjet printer has been criticised by some users. We investigate further to reveal whether or not the Brother DCP-135C all-in–one printer is a good buy or merely a device to steer clear of. The Brother DCP-135C compact colour inkjet multifunction printer comes with a CIS scanner and an ADF-integrated digital copier. The DCP-135C is fairly robust, measuring 5.9 inches tall, 13.8 inches deep, and 15.7 inches wide and it is USB compatible for plug-and-play convenience. Up to 100 sheets can be loaded into the paper tray, while the output tray can support up to 50 sheets at a time. The Brother DCP 135C printer runs on 16MB of RAM and prints at a maximum resolution of 1200x6000dpi. The control panel is conveniently positioned on top, slightly angled for easy access to the minimal buttons and the small LCD display. A multi-purpose paper tray accommodates glossy and 6x4-inch photo paper. 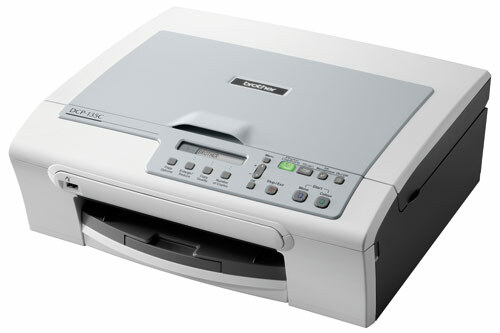 There is an automatic document feeder, too, which is useful for copying or loading documents with several pages. The ADF is also a useful feature for the scanner. The Brother DCP135C inkjet printer uses high-yield inks. Users can directly print from a USB flash drive and a digital camera. The Brother DCP-135C weighs 7.1kg, making it quite heavy and difficult to transport or move around. Print speeds are not according to Brother's claims (25ppm in monochrome and 20ppm in colour); in reality, it is sluggish and colour output is sub-par because of under-saturation. Banding is obvious on colour images as well. Offices may not be pleased with the overall performance of the Brother DCP135C all-in-one despite being a multifunction aimed at both homes and small businesses.